Welcome to Bathing Bliss!! 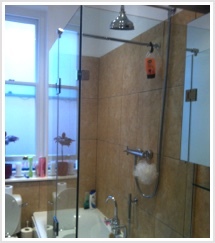 We supply the finest made to measure (or bespoke as some may say) glass shower solutions on the web. 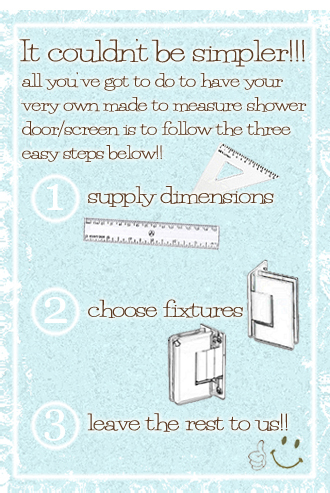 If you need a frameless shower enclosure, a shower door or even a simple bath shower screen, read on and see how simple it can be to achieve your own bathing bliss!! where we here at Bathing Bliss are enormously skilled (even if we do say so ourselves). fabricate beautiful coloured glass splashbacks and worktops for that extra bit of luxury! links at the top of the page. You select the option you require, choose your fixtures, then after making a simple measure of your required area (no need to be mm perfect at this stage) supply us with these details by calling either 0845 0450336 or 01642 648444 or even emailing sales@bathingbliss.co.uk and we'll provide a cost which will include everything needed and delivery to your desired location. An Extra Touch of Luxury!! Aswell as being one of the finest fabricators of made to measure shower screens and doors, we also offer a beautiful range of made to measure coloured glass splashbacks and coloured glass worktops to add that extra touch of bathing decadence! Now you can do away with tiles and tile grout and enjoy the seamless finish which only large panes of coloured glass can offer. Not wanting to leave out your vanity unit, why not finish it with a worktop coloured to match the splashback? Leave It Up To Us To Work Out The Technical Mumbo Jumbo! Just simply measuring the area you want to fill with glass can be a daunting process but then having to worry about how many mm you need to remove from the glass to allow for your door, screen or even full shower enclosure to fit successfully can be enough to put you off (particularly when you consider the fact that the glass needs to be toughened and once toughened can't receive any further fabrication)!! This is where we come in, and where our technical expertise shines (hopefully without sounding in any way big headed). You simply give us your aperture sizes (i.e. 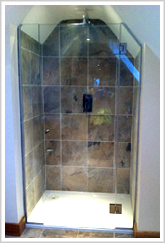 the area or space in which you want to have glass) and we'll work out exactly what's needed to make your shower screens, shower doors or shower enclosures fit. 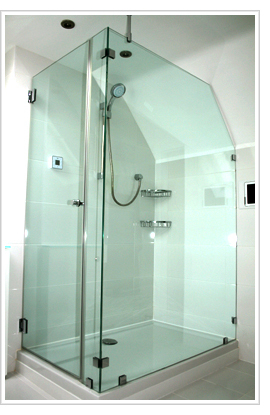 We can even offer particular design solutions you may have not thought possible, as we understand implicitly the fixtures and fittings required for frameless shower screens and shower doors and how they work (once again, saying this hopefully without heads growing in size). After the initial measuring you then only need to worry about which of our hinges and handles you like and whether you want them shiny or not!! We really do offer a first rate product and service which won't break the budget but still leave a very unique made to measure glass shower solution. Have a look through the site and get a feel for what we can offer then give us a call on either 0845 0450336 or 01642 648444 and chat through your designs. If you can't get to the phone send us an email with your basic ideas and if possible rough dimensions to sales@bathingbliss.co.uk and we'll provide as much advice as we can and as many budgetary quotations as you would like! !